I had the privilege of attending Maria Killam's True Color Workshop a few weeks ago in Vancouver, BC. Maria just did a wonderful post on our class. Check it out here. 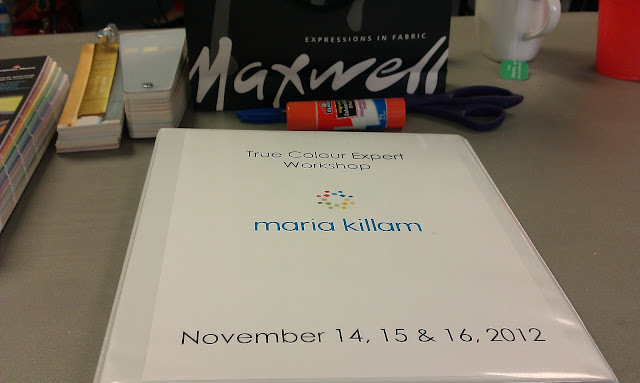 I have followed Maria's blog for years (I've actually read every post) and ever since she announced her color workshops a few years ago I have wanted to attend. I finally got my chance! A peek of what greeted us each day! LIGHT or DARK (also called value). WARM ( Red, Yellow, Orange) or COOL ( Blue, Green, lavender). CLEAN (bright) or DIRTY (muted). 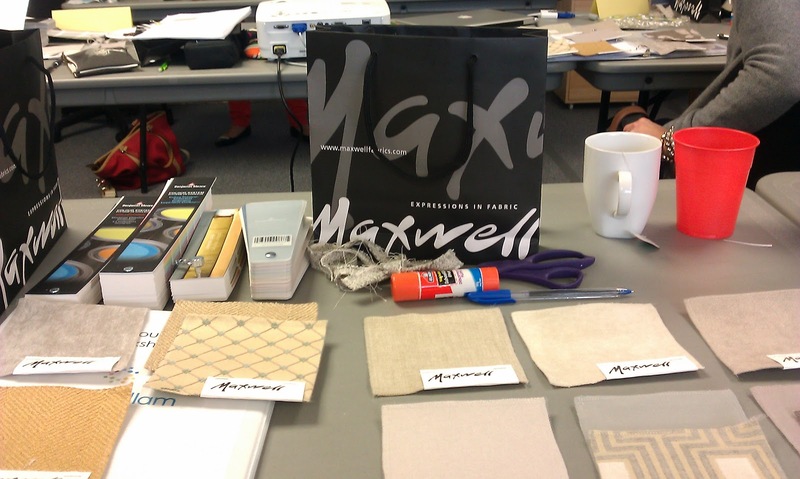 In this exercise we are using our new found undertone knowledge to work with fabric samples. 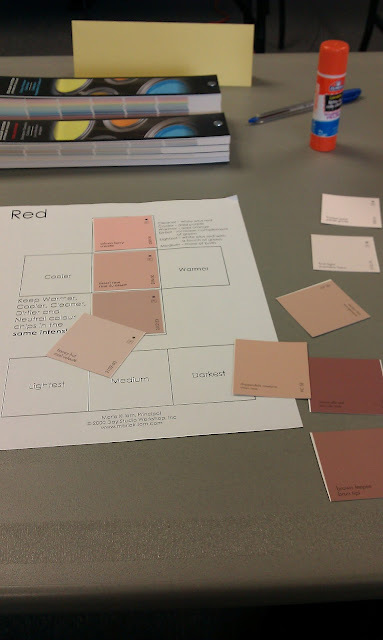 Neutrals are the hardest to combine (if you don't pay attention to the undertones) and in this class we went into depth. If you are interested in knowing more on this topic I highly suggest Maria's e-book! Maria at work testing different paint colors and how they work with the "fixed" elements. We had so much fun as we explored the world of undertones. We talked about creating flow in your space. We talked about how to perform effective color consultations for interior and exterior spaces. I really enjoyed that the workshop that was a mix of lecture, hands on learning and interacting with other designers (new and seasoned). We really got the best of everything! Here is a group of my class and newest friends! You can't miss me in the bold blue coat! (Back row) Tracey Ashburn, Debbie Fahlen, Tracy Herbert, Vanessa Rider, Carole Willard, Anita Herman, Renata Clunies Ross, Jennifer Harper. (Front row) Laurel Collins, Annie Vincent, Maria Killam, Monique Milne, Naomi Kay, Marcia Lima Rodrigues and Carolyn Marshall. This post wouldn't be complete without a mention of my wonderful roommate Carole Willard! She was so much fun to be with and I really enjoyed experiencing the workshop together! As the True Color Expert in Arizona, armed with my large color samples, I can help you create the look and feel that you desire! Check out your options on my services page! What a fabulous opportunity. It looks like you learned a lot. 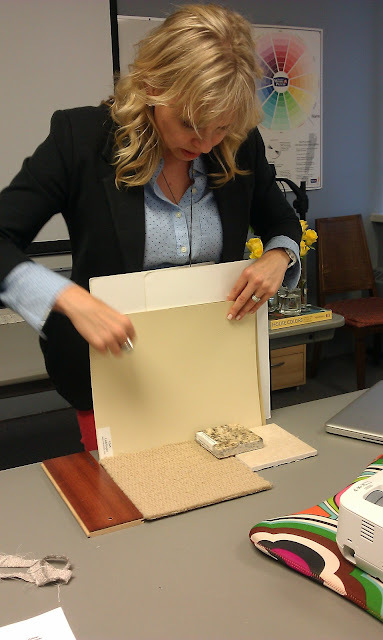 I can't wait to see what changes you make in your home with your newfound knowledge! Love your blue coat!